The practice of law has many challenges, but the business side of the practice of law is, arguably, even more challenging. Having practiced as a lawyer for many years and a coach, professional mentor, and consultant for many more years, I have learned that there are ten challenges that must be overcome in growing a practice. Successfully addressing these ten items will help your business thrive. Covering increased cash needs to fund expanded accounts receivable. Funding the need for more educated personnel and lawyers as new sales revenue occurs. Monitoring accounts receivable to ensure that clients honor the payment clause of their engagement agreements. Determining if clients who fail to honor their commitments in the engagement agreement need to be fired. Deciding whether to continue to do pro bono work for economically troubled clients. Creating a line of credit with your bank to carry you during the shortfalls. Providing a clear path for repayment of the line of credit. Restraining the use of the firm's line of credit to pay lawyers' draws. Staying with your strategic plan or modifying it as need be and preventing your firm's rogue lawyers from going outside of the firm's strategic plan. Good luck has been defined as the intersection between preparedness and opportunity. With this list, you can be better prepared—and preparedness seems to beget opportunity in turn. However, it should be noted that reading about these techniques is the easy part. Consistently implementing and following through on them, however, requires perseverance and tenacity. That is your part in this equation. 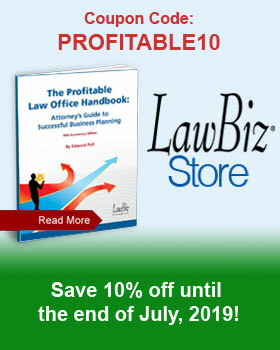 Are you looking for helpful legal advice on growing your law practice? Contact a legal coach today at 800-837-5880.